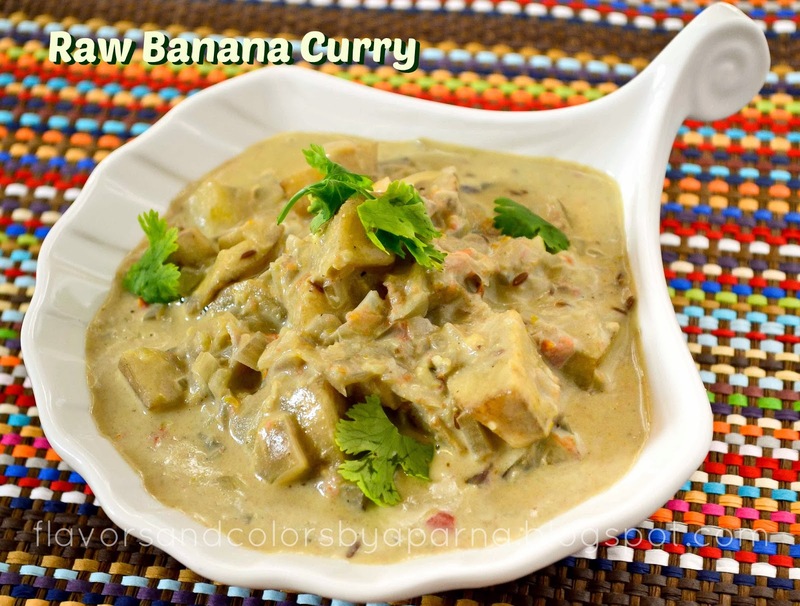 I never used raw banana other than traditional amchi dishes. So when I came across it's recipe which used cashew paste, it was something new to me. The rich creamy curry with its inviting looks, and I had to attempt it. The recipe was shared by our FB friend on a food group [Thanks VNS for doing so]. After tasting the dish, a thought crossed my mind and it was raw bananas can surely be a healthy option instead of paneer in paneer based dishes. The best way to know the deliciousness filled in this curry is to try yourself and let me know how you find it. Soak cashews for 15 minutes. Transfer these soaked cashews to smaller jar of your mixer and grind it to a smooth paste. Keep it aside. Heat oil in a pan. Add cumin seeds and as it splutters, add finely chopped onions. Saute them till they turn translucent. Next add finely chopped tomatoes and stir fry until they become soft. Add grated garlic ginger and green chili paste. Mix well and saute for 2 minutes on low flame. Now mix diced raw banana pieces and stir fry. Add 1/2 cup of water, salt and sugar according to taste, cover with lid and allow it to simmer for 5 minutes. Lastly add cashew paste and continue cooking on low flame, gently stirring the mixture throughout. Once the gravy comes to boil, switch off the flame. 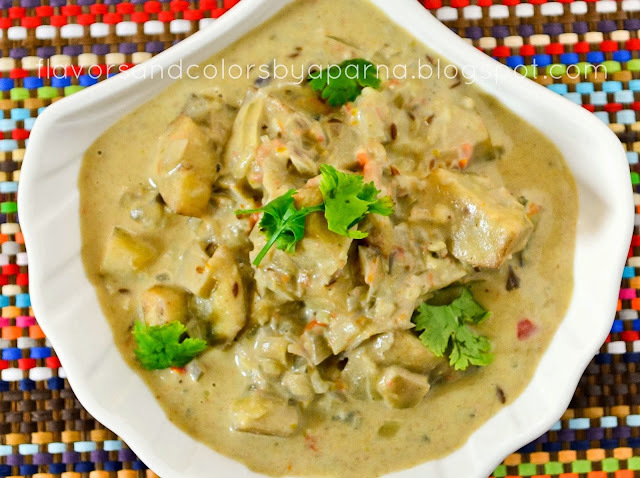 Garnish with coriander leaves and enjoy this curry with chappatis/phulkas/rotis.